By the time you read this, it will be St. Patrick’s Day. I’m looking in my closet and noticing a shocking lack of green. If I hadn’t just spent a bunch of money redecorating my house, I’d say it’s time for a shopping trip. If anybody tries to pinch me, I will kick them in the face. I didn’t get that red belt in Tae Kwon Do for nothing. These brownies have a hint of green, so I think they’re safe. They’re also bursting with minty goodness courtesy of a peppermint ganache layer that’s tucked sweetly between dark chocolate brownies and a thick chocolate icing. This whole situation is pretty dreamy. Like give me that pan and shut up and don’t you dare try to wake me up from this sugary minty dream type of situation. You can make these for St. Patrick’s Day, but if you save these for only one day a year, you’re making a huge mistake. If you love chocolate and mint, you need to be making these always. They’re simple to make and don’t require a mixer or any strange ingredients other than peppermint extract. They don’t take that much effort, but they do take some time for all of the layers to cool and set properly. I was impatient, and that’s why my mint layer is a bit drippy. Can’t lose the light, ya know? 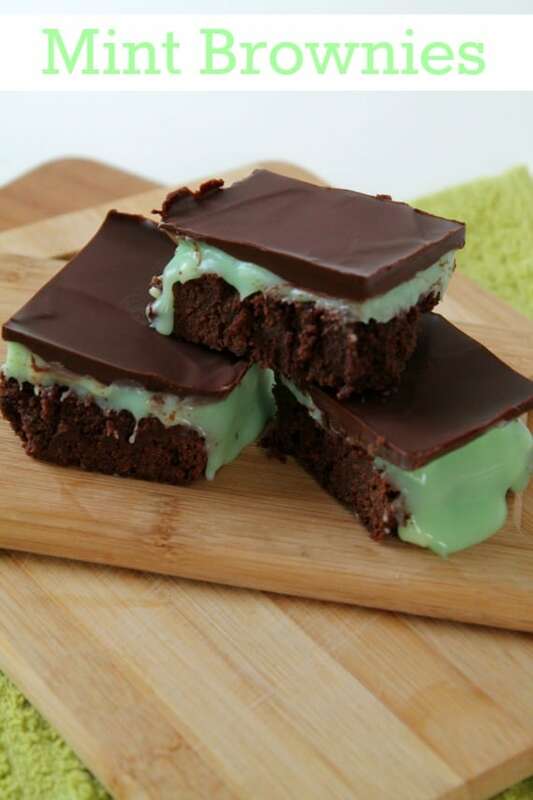 Show up to a gathering with mint brownies and everybody will want to be your best friend. These would probably be pretty tasty with a glass of Bailey’s on the rocks. That’s a thing, right? It should be a thing. 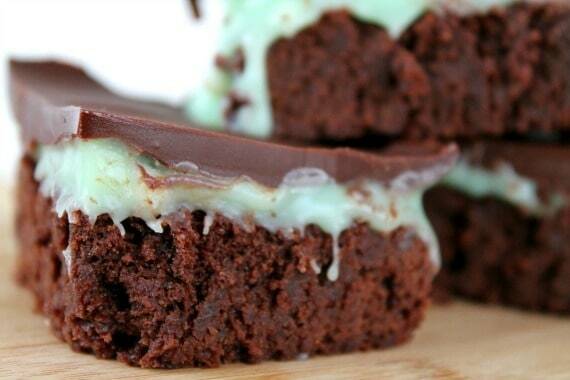 Mint brownies are a thing. An awesome thing. A million times better than store bought, and infinitely more delicious. Go. Make. Eat. Smile. 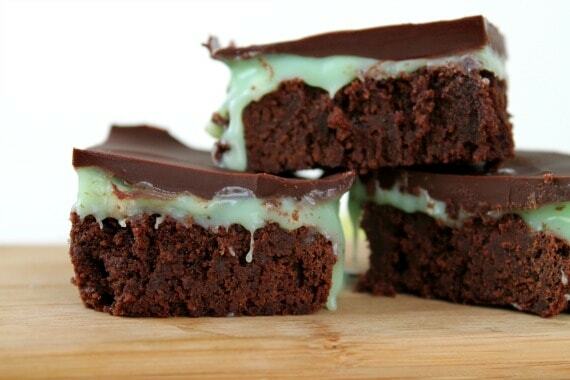 Brownies topped with a peppermint ganache and a smooth chocolate layer that are perfect for St. Patrick's Day. Also, all the days. Preheat your oven to 350 degrees and spray a 8x8 inch pan with non-stick spray. Put butter and dark chocolate in a microwave safe bowl and microwave 30 seconds at a time, stirring after each interval, until melted. It took me about a minute. Stir until smooth and allow it to cool for about five minutes. In a medium mixing bowl, whisk together eggs and sugar until it becomes pale yellow. Fold the chocolate mixture into the egg mixture with a rubber spatula until combined. Sift the flour, baking powder, and cocoa powder into the wet ingredients and fold everything together to form a thick batter. Pour the batter into your baking pan and bake for about 15 minutes or until just set in the middle. Allow to cool completely in the pan. I put mine in the fridge to speed this along. Put the white chocolate in a small bowl. Heat the cream over medium heat until it just barely starts to bubble. Pour the cream over the white chocolate and stir slowly until the chocolate is melted. You can pop it in the microwave for 30 seconds if you need additional heat. Keep stirring until everything is relatively smooth. Stir in the peppermint extract and green food coloring. Put this in the fridge for about 15 minutes to cool it down, then spread it over your cooled brownies. Put it all in the fridge for at least 45 minutes to until the green layer is set. Put the chocolate, corn syrup, and butter in a microwave safe bowl and microwave 30 seconds at a time, stirring after each interval, until everything is melted. Mine took 1 minute. Stir until smooth. Allow the mixture to cool enough so that it's still pourable but not hot. You don't want to melt your peppermint layer. Pour it over the top of your brownies and gently spread it to the edges. Be careful not to go through to the green stuff. Put it all back in the fridge until the top layer is solid. Slice, serve, and do try to share. It's only polite. There's a lot of waiting between steps. Your patience will be rewarded. Mmmm these sound so good! I love the combination of mint and chocolate. They ARE so good! Make them this instant!